Many of the questions surrounding the planned brewery addition to the Twin Peaks franchise in North Irving were answered in a recent article published by Nation's Restaurant News. Though, considering recent changes in legislation, one had to wonder how the eventual Irving brewpub might go about servicing additional locations with their in-house brews. 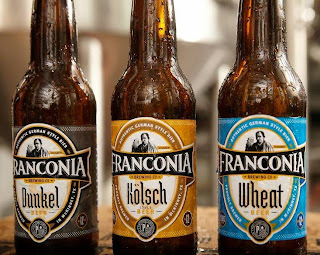 To gain insight into this, and to get an idea of the size and scope of the new venture, I got in touch with Master Brewer Tom Janik for details. While he confirmed that distribution to other Texas locations is in the cards, he notes that it doesn't come without certain restrictions. Senate Bill 515 allows brewpubs to self-distribute up to 1000 barrels provided they only sell their own products. In other words, for the brewpub to be able to sell directly to retailers (including other Twin Peaks locations) they would no longer be able to carry outside brands. Since this isn't how the restaurant wants to operate, Janik concedes that "distributing our own beer will never be an option for us." Besides that, he expects to brew anywhere from 6000-8000 barrels in the first year, which would put them well above the cap for self-distribution. The end result is that wholesalers will have to be used to shuttle beer to other sites. Regarding the capacity estimate, in order to meet their production goals the Twin Peaks operation will necessarily dwarf many area production breweries. A 30 bbl brewing system designed by Specific Mechanical will include six 60 bbl fermenters. This equipment will be used to brew double batches of their Dirty Blonde, Knotty Brunette and a new creation to be called Ginger's Ale. 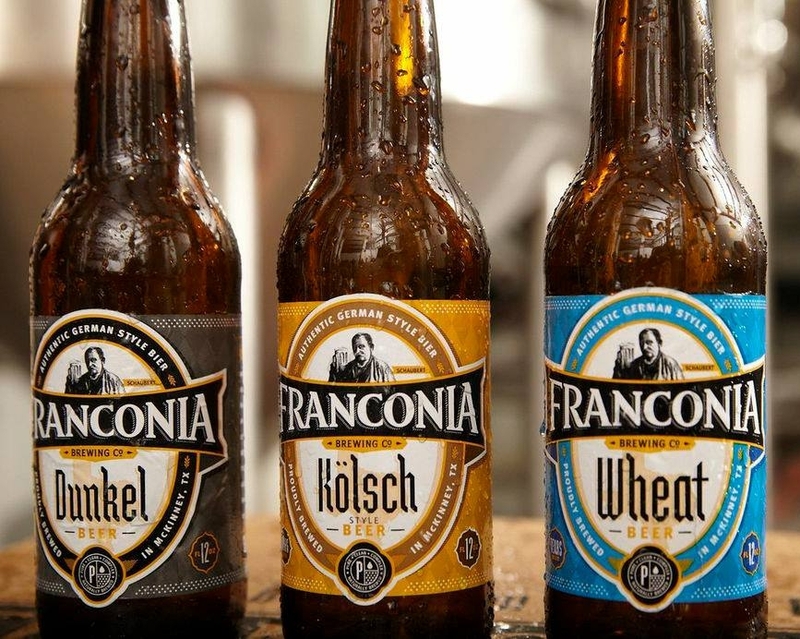 Up until now, the first two on that list have been brewed by Franconia in McKinney. Naturally, once the brewery is operational (tentatively scheduled to happen by year's end), this will no longer be the case. One of the reasons to take on the brewery project was to have more control over the aforementioned brews. Twin Peaks operates using a scratch kitchen model, meaning all of their food is prepared on-site. Given that approach, Janik points out that "it was only a matter of time before we moved that into our beverage program as well." He goes on to say that their beer "will have the same strict expectations as our food, which includes being fully made from scratch, using the best ingredients possible, and executing at high quality standards." As for what the future holds, the short-term plan is to brew only the three beers, with demand and customer feedback guiding future brewery output. In one of Aesop's Fables a lion goes hunting with a fox, a jackal and a wolf. Working together, the animals down their prey, only to have the lion take all the bounty for himself. Afterwards, the fox asks the all-important question: shouldn't those who share the labor also share the spoil? It's a message that has particular meaning in relation to the Lakewood Brewing Company's first anniversary brew. In coming up with the name, those at Lakewood recognized that they owe much of their success to all who have supported them as they've worked to build the brand and make the brewery a reality. To honor that, they offer their fans the Lion's Share. Described as a Belgian-style Double IPA, Lion's Share gets its foundation from an amped up version of the brewery staple Hop Trapp. Initially fermented with that beer's regular yeast strain, Brettanomyces was added later in the process and the beer allowed to age for eight months in the same Bulleit Bourbon barrels used to create Bourbon Barrel Temptress. Perhaps not surprisingly, first sips of the resulting brew inspire a simple-sounding description along the lines of a bourbon barrel Brett beer. However, the depth of this brew goes well beyond that. With secondary nuances of caramel, dark sugars, subtle fruits, wood tones and more, Lion's Share is probably one of the most complex offerings to come out of a North Texas brewery to date. It also might be one of the most limited. You'll notice that the full name, Lion's Share I, contains a Roman numeral designation. This will change, along with the beer's style, each year Lakewood celebrates a new anniversary. In other words, it's a one-off that will last only as long as the brewery maintains stock. Though, I'd imagine a few kegs will be held back for special occasions. Were you to seek out the ideal host for a beer dinner, the name Garrett Oliver is one that should immediately come to mind. Originally named brewmaster for the Brooklyn Brewery in 1994, Oliver has gone on to author The Brewmaster's Table, and has served as editor for The Oxford Companion to Beer. Given these qualifications, along with his many other industry accolades, there is perhaps no one more qualified to speak on the art of pairing beer with food. 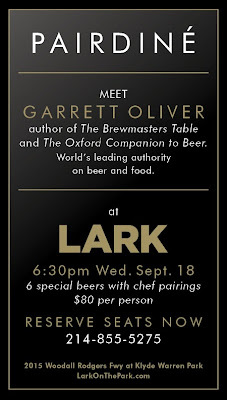 Coming up on Wednesday, September 18, you'll have the opportunity to hear and learn from the master when Lark on the Park hosts Oliver for a "specially curated beer experience" at their location facing Klyde Warren Park in downtown Dallas. Oliver is "considered [to be] one of the foremost authorities on beer in the world. 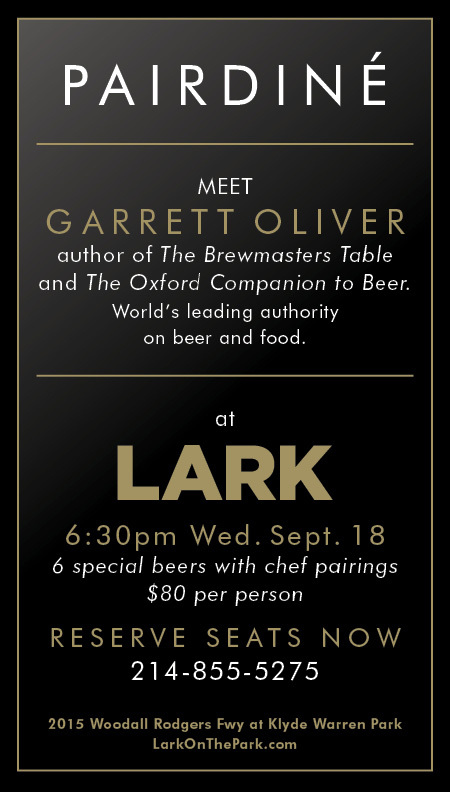 The evening will feature an expert-guided beer tasting experience led by Oliver, coupled with food pairings from LARK chefs Dennis Kelley and Melody Bishop. The event will kick off with a reception at 6:30 p.m., followed by a seated dinner at 7 p.m. Tickets are $80 per person, including tax and gratuity, and can be purchased in person at LARK or by calling 214-855-5275. Seating is limited, and the event is expected to sell out quickly."